BREATHABLE TECHNOLOGY: Lightweight with breathable material, Easy to packable, Quick-drying, Suit for all seasons.adjustable drawstring provide maximal wind protection in bad weather. MORE DURABLE AND COMFORTABLE: Polyester and nylon fabrics,Anti Microbial,Air permeability,Wearproof,Flexibility,the perfect combination of ergonomic. ATTACHED,ADJUSTABLE STORM HOOD: High quality front-zip with a waterproof flap with hidden buttons on both ends.2 side-entry pockets and 1 chest pocket with flaps covered,safe and convenient. Adjustable ergonomic cuffs with velcro. MULTIPLE USES: Rain jacket suitable for rock climbing, skating, shooting, fishing, cycling, equestrian, hunting, hiking, camping, mountaineering, traveling, outing, drive etc. WARM NOTE:The biggest advantage of this raincoat is not waterproof but lightweight. 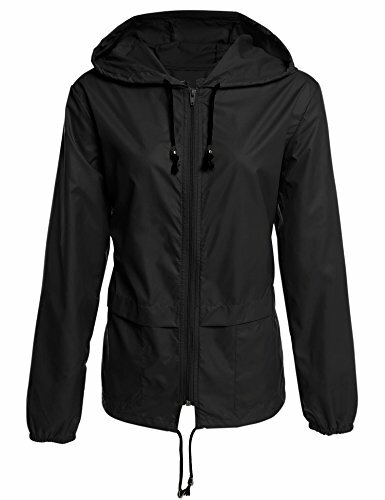 It's not suitable if it rains heavily.This is a thin nylon rain jacket but not warm coat.Please check the size information under the product description before ordering.If you have any questions, please feel free to reach out to us, we are eager to serve you. Thanks! There are 5 sizes (S/M/L/XL/XXL) available for the following listing. Please allow 0.5 inch differences due to manual measurement, thanks. S----Shoulder 16.6"----Sleeve 23.8"----Chest 44.1"-----Length 26.1"
M----Shoulder 17.2"----Sleeve 24.2"----Chest 46.0"-----Length 26.5"
L----Shoulder 17.7"----Sleeve 24.8"----Chest 49.0"-----Length 27.1"
XL---Shoulder 18.3"----Sleeve 25.2"----Chest 51.9"-----Length 27.7"
XXL--Shoulder 19.1"----Sleeve 25.4"----Chest 54.9"-----Length 27.9"